Former independent presidential candidate Rep. Ahn Cheol-soo announced on Thursday that he would launch a new party in the coming months, potentially reshaping the political landscape currently dominated by two parties. Saying that inter-party conflict was holding back Korean politics, Ahn said that a tentatively named “new politics promotion committee” would be launched to lay the foundations for his party. “The aim is establishing a party. There exists a national demand for new politics. The new politics committee is a step in that process,” Ahn said. He added that his brand of politics was focused on the “politics of life” and that various events would be held across the nation to listen to public opinion and express his views. Ahn, however, declined to elaborate on further details including who would be joining his party and the timeframe for his plans. “The committee will draw up a roadmap for the timing. But, I will say that (the organization) will take part in the provincial elections responsibly,” he said. The elections for provincial governments are scheduled for June 4. Although Ahn was initially anticipated to field candidates in the October by-elections, he stayed out of the race for two parliamentary seats, saying that he would focus on the provincial elections. While Ahn declined to elaborate on his recruitment plans, a number of politicians connected to the main opposition Democratic Party are thought to be readying to join Ahn. Ahead of Ahn’s announcement Lee Kye-ahn and Ryu Geun-chan severed their ties with the party. Lee served in the 17th National Assembly and has been heading the DP’s committee for Seoul’s Dongjak-B constituency since last year. Rhu was a member of the Chungcheong-based Liberty Forward Party until its merger with Saenuri Party last year. Former lawmaker Kim Hyo-seok is also said to be considering following suit. Kim is in his third term as a DP lawmaker, having entered the Assembly in 2004. Over the course of his political career Kim served in key positions including that of the floor leader and the chief of the party’s policy committee. While the DP’s official stance on the issue has been ambiguous, with Rep. Bae Jae-jeung saying only that Ahn should show the “intention to walk the right path,” individual DP lawmakers have played down its implications. “Building a house in the middle ground, and taking it to the elections, that could be a misjudgment on Ahn’s part. As all attempts from a third position have failed in the past, the wise decision would be to bring about a merger,” Rep. Min Byung-doo said in a radio interview, referring to past attempts to create a third party to rival the ruling and main opposition parties. Min is the chief of DP’s strategic public relations. Regarding news of DP politicians moving towards Ahn, Min said that such developments would give Ahn’s party the image of having split from the DP. Despite the DP’s apparent outward calm, survey results show that Ahn’s party would pose a serious threat to the main opposition party. A survey conducted by the Korea Social Opinion Institute showed that 27 percent of voters would support Ahn’s party, with only 12 percent sticking with the DP. As for the ruling party, it honed in on the lack of details in Ahn’s announcement, attacking him over his characteristic ambiguousness. “Rep. 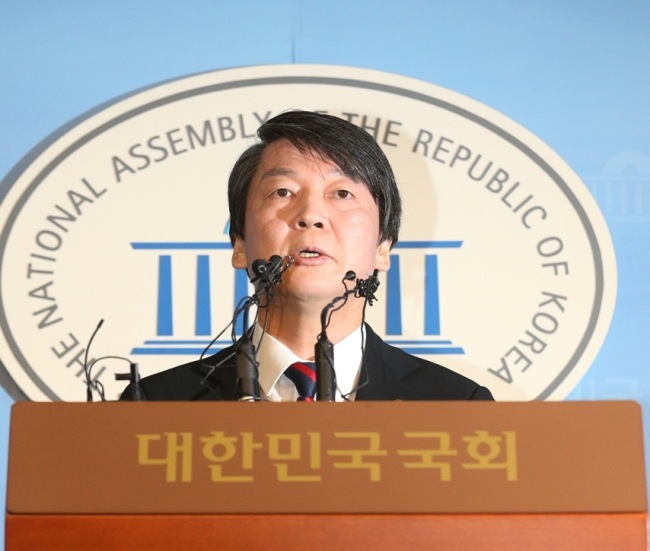 Ahn said that Korea’s politics was unhealthy, and that a new political force must arise but failed to provide details about the timing of the new party’s launch, and the party’s ideology or philosophy,” Saenuri Party spokesperson Rep. Min Hyun-joo said. Comparing Ahn’s manner of speech to “walking through fog,” Min also called on the independent lawmaker to further clarify his intentions.